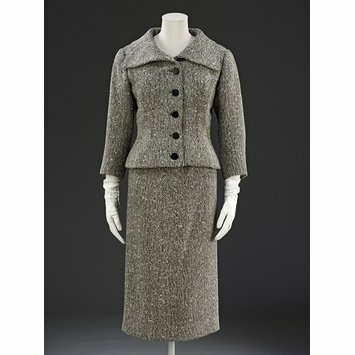 Jacket and skirt of black and white tweed lined with silk. The suit is comprised of a fitted jacket with magyar sleeves and a slim-fitting skirt with a kick pleat at the back. The skirt is comprised of four panels gathered into the waistband. The hems are machine stitched but other details are completed by hand. The hems are only turned once and the raw edges are bound with silk chiffon and blind stitched into place. Catalogue: Hommage a Balenciaga (Musee Historique des tissus Lyon: 1985), p. 73 and 74. 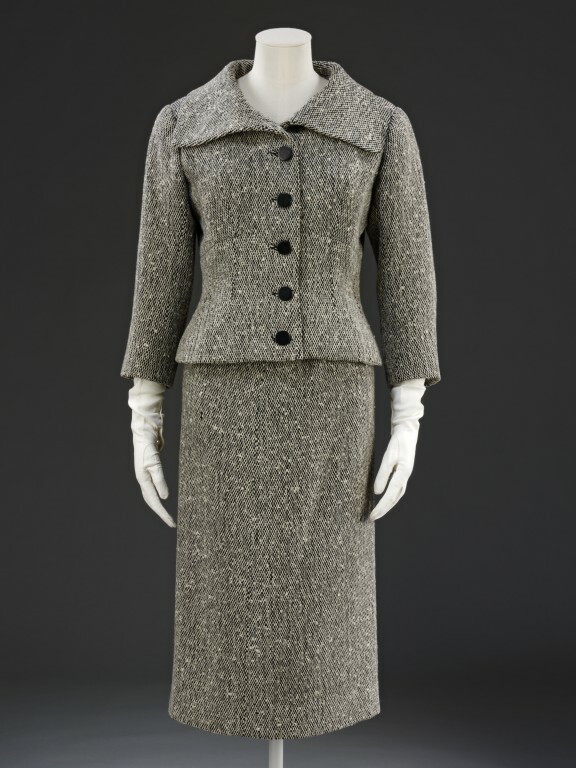 This classic Balenciaga suit includes many of his signature features: a stand-away collar, threequarter ength sleeves and a relaxed waistline. Like all couture garments this suit was made to the exact measurements of the client, a process which took up to three months and required up to three fittings. The film opposite shows how it would have been made. In a survey of French couture houses compiled at this time, Celia Bertin wrote of Balenciaga, ‘I noticed long ago that women who wear his tailored suits seem to have them moulded on to their bodies, so much do the jackets appear wedded to their figures, while leaving them complete freedom of movement’.